I was lucky enough to be on Mar’s team having a look around HMS Belfast a couple of weeks ago ahead of #remixtheship. Veteran of two museomixes, and an OCL kids remix project, I am, as always excited to see what the teams are going to come up with and slightly nervous about the sleep deprivation! I love that Belfast was also an aircraft carrier, with two Supermarine Walrus on board (single engine amphibious bi-plane – see that sounds cool right?) which was launched by a catapult, and the hauled back on deck by a crane. There has got to be a story to tell there right? She was involved in some major conflicts from Arctic Convoys to D’Day and then in her later years spent much of her time out in the Far East. Belfast was blown up by a mine early in WW2 and then later shelled during the Korean War but it wasn’t enough to stop her! Plenty of material there. Belfast is part of the National Historic Ships and the first naval vessel to be saved for the nation since HMS Victory (apparently according to Wikipedia). Most of all it is a really cool space, which is nothing like we have remixed before, so come on join a team and sign up today! Oh and if you want to know what being part of #remixtheship is going to be like? Well it’ll be like nothing else! You will forge friendships in moments, probably want to kill someone or throw a piece of kit or all your kit out of the window/porthole/off the deck, mainly live off sugar and caffeine, get up early, go to bed late and have one of the greatest experiences of your life (hopefully) It will be the most creative and frustrating couple of days and in this case you get to play on a big ship! So what are you waiting for? We made the best of the Easter bank holiday and took the opportunity for a day out in Southsea. There is plenty of museums in the area but we decided to investigate somewhere a little be different on our adventure – the Eastney Beam Engine House. Saved from development due to it’s Grade two listed status, the exterior of the building is beautiful enough on it’s own but the engines inside are also fabulous. We were welcomed warmly and given some basic information about the building and the beam engines inside. Sadly the beam engines were not in steam on the day we visited due to a technical issue. The two James Watt and Co beam engines were installed in 1887 to aid Portsmouths new sewage system. The effluent was collected in large holding tanks and then pumped out to sea on the ebb tide using the engines. The engines were superseded by more modern technology but they were kept as an emergency back up to the system until 1954. Renovations have taken place on a number of occasions since the 1980s. I do love these late victorian buildings, the fact that beauty and design was incorporated into a municipal building – much nicer than the pumping stations of today (although I am sure there are people who find beauty in these things!). They seem to be churches dedicated to engineering. The Engine House has huge windows which draw in as much light as possible. The machinery and interior is so well cared for. All the brasswork is polished to a shine, the floors are all clean and tidy, it makes exploration easy and clean. As with any building housing machinery such as this it also smells amazing, with the scent of grease and oil! Growing up in the 1980s I was not stranger to the terrorist bomb, the IRA were always in the news and we all became wary of unattended luggage (I am still nervous if I see a bag without an owner) and had dustbins removed from various public spaces. As someone pointed out to me recently, although the IRA were a destructive force, they were more disruptive. They telephoned ahead to warn you (in many cases) and although damage was done and lives were sadly lost, there was often a chance to reduce the casualties. You were also more than well aware of their case and what they were fighting for. I think the way we think changed when the bombings on the London Transport system occurred 10 years ago today. Suddenly everyone and anyone was a target, without a warning and without a reason (or at least one that is obvious to most of us wandering the streets of this country). Men of this country had become martyrs (in their eyes at least) to a religious campaign, one of which most of us was unaware was even on our shores. Suddenly we were all frightened and scared and yet defiant – well we are British, it’s what we do. Looking at the commemorations today there has been some comment that it is a ‘London Thing’, it’s not for us non Londoners. I am not from London, but I lived there briefly and I visit there often, I can find my way around without an A to Z. I felt part of that sadness that hit this country after the 7/7 attack and I still do today. Not because of the city that was targeted but because people were killed, seriously injured and lives were changed that day. Ultimately we were all victims of that bombing, our countries thinking has changed in many ways. Misunderstanding of the teachings of Islam have caused fear and hatred among parts of our society. The government is watching us all, much more closely that we knew before. As I reflect today on the attacks on London in July 2005 I will be thinking of the families and friends who lost someone on that day. The people who survived with mental and physical scars to fight another day. The people who have become victims of other peoples narrow mindedness and misunderstanding. I also mourn the country we had before the bombings. I hope that the country that we have now can still love it’s neighbour, enjoy and learn from it’s cultural, traditional and religious differences and become a safe place for us all to live. As a child, I grew up in what was once part of the industrial heartland of England, Horwich, Bolton, Lancashire. During my childhood the town was still subject to shops shutting on a Wednesday afternoon (I was pleased to hear that a few still do) and the town closing down for ‘Horwich Holidays’. Horwich made it’s fortune in the production of steam locomotives – at the Lancashire and Yorkshire Railway factory, built in the town in 1887. Like many industrial towns in the North it’s workers holiday – Wakes Week was set for a week in the summer. In the case of Horwich, the holiday began on the Saturday closest to 12th July. With workers heading to Blackpool to get away from the industrial life and take in the healthy seaside air. These holidays had begun as days out for the workers in the mid 19th century but then factories set up saving schemes to allow workers to save for a weeks summer holiday. I can’t imagine what the affect of having most of the population of Horwich descend on Blackpool would be like, but I suppose it explains why they needed 3 piers! Bolton took it’s holidays over two weeks (starting the last Saturday in June) this was Bolton Holidays. With the other Lancashire industrial towns Oldham, Rochdale and Bury slotting in their wakes weeks in between. Those embarking on their summer holiday would arrive at the station and a ‘Special’ (a train, timetabled especially to carry the workers to their holiday destination) would pull out of the station and carry you to the seaside. Over the years the holiday destinations included more far flung places than Blackpool, initially other coastal towns in Lancashire and in North Wales but later to Newquay, Great Yarmouth, Torquay and Bournemouth. As they became more affordable, the car began to take the strain, as families chose to drive themselves to their holiday destination. Then came the aeroplane when the package holiday became the big thing. With these changes in holiday habits went some of the wakes week holiday traditions. It also saw the decline of the Locomotive industry in Horwich. My family ran a local business and the business closed for a week during Bolton Holidays until the 1990s. Many people in Bolton (our family included) continued to take their summer holiday during the traditional Bolton Holidays. The school holidays also fitted in with the wakes weeks, schools in Horwich would have a 6 week summer holiday starting the last Saturday in June (Bolton Holidays) so families working on the larger local town could take their holiday together. This 6 week break also covered Horwich holidays and pupils would return to school in mid August. Scholars in Bolton would have the 2 week Bolton holidays and then go back to school for 3 or 4 weeks then take a 5 week holiday (the final week of which was ‘September holiday which was also a holiday in Horwich). This provided the chance for a number of more affordable holidays over the summer not in the ‘peak season’. With the decline of the Locomotive works in the 1950s and 60s after nationalisation Horwich became a less industrial town. By the 1980s the Locomotive works was closed completely. Bolton was no longer in Lancashire but now in Greater Manchester. Victoria Mill (the only mill in the town) closed in 2007. Both industrial sites being redeveloped for housing, as Horwich became a commuter town for nearby Manchester. With the loss of the old types of industry and changes in workers rights, the traditional Wakes week holidays were also becoming a thing of the past. The end of my attachment to the Bolton Holiday’s came when the schools in Bolton came in line with the majority of the country, with standardisation of school holidays (I think in 1994). Because Horwich, Bolton and the rest of the country all had different holidays the school children of Horwich got a 14 week summer holiday to bring us in line with the rest of the country. The week this blog is published is Bolton Holidays (as was!) and my parents have come to visit me on the Isle of Wight – my Dad is a great believer that the weather is always fantastic on Bolton Holidays week, this time he is not wrong as we are currently in the middle of a heatwave! A few times this week we have heard a Bolton accent in a cafe or on the promenade and presumed they were away for Bolton holidays too. Despite the best efforts of centralisation, mill town traditions die hard! I hope that heritage organisations are documenting the traditional Wakes Weeks holidays for future generations, to discover that we weren’t always a 24/7 365 day a year operation. There was a time when the whole town shut up shop and shipped out to the coast for a holiday! A little thank you to my parents for sharing their remembrances of wakes weeks holidays, my Mum from a teachers point of view and my Dad from the point of view of the family business. It took us quite a while to fathom out how they all fitted together! Also thanks to Horwich Heritage for confirming the dates of Horwich holidays. As a child Bolton Museum was our local. The museum is housed in a lovely Neo-Classical Crescent of imposing sandstone. The building houses an aquarium in the basement – as a child spotting the one eyed piranha was the highlight of any trip! The central library on the ground floor and then a museum with 3 main galleries on the top floor. Childhood highlights for the museum was obviously the Egyptian display complete with Mummies! Closely followed by the gallery full of Taxidermy – obviously displaying animals of the world. I have since discovered this was is a mainstay of many local museums in the early 1980’s. I was slightly surprised that on a visit to New York’s Natural History Museum in 2010 they also had a gallery full of stuffed beasts which was very reminiscent of my visits to Bolton Museum in the 1980’s! I remember my Mum taking my sister and I to the Museum quite a few times, sometimes with friends and at least once with my Granny. I also recall my Grandpa taking us once in the summer holidays. I have spoken before about the importance of my childhood exposure to museums and heritage which has grown my love for all things old and musty! There was obviously the obligatory school trip to the museum. 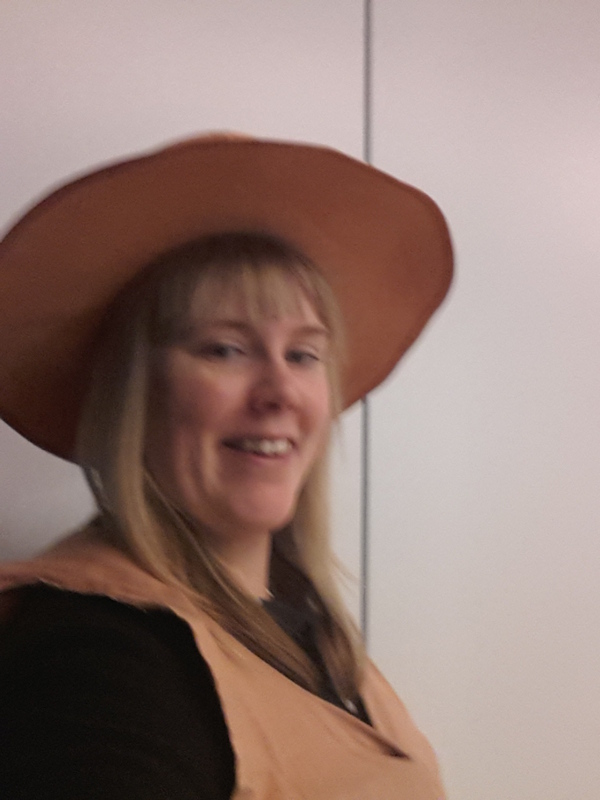 I think we were learning about either Greeks or Romans and we sat in a theatre and there was dressing up involved! In my teens I remember taking myself and my friend Kat to see an exhibition on 20th century design, which included the same dinner service my parents had got as a wedding present. I also had a weird teenage date looking at the fish in the aquarium! Bolton Museum had rarely crossed my mind since until it hit the headlines in 2011 for selling a portion of it’s painting collection to raise money to repair the storage depot. In these times of austerity these are the difficult decisions that have to be taken, and it is only with better funding and support for these types on institution that will ensure their survival for the next generation. In one simple phrase, use it, donate to it or lose it! Earlier this year we had to have a tyre repaired on our car whilst visiting relatives in Bolton. These things are never straight forward are they? So we took the short walk into town to kill some time while we waited for the repair to be done. On a cold March morning we sought refuge in the Museum. I will be honest I was really happy with what I found! After the whole cash strapped headlines, I was expecting nothing to have changed since my last visit in the late 1990’s but I was greeted by a really interesting and informative modern exhibition on the history of Bolton. The stuffed creatures were no longer on display (maybe they are all in the newly repaired stores!) and had been replaced by a detailed history of the emergence and growth of my home town. Once more, there were quite a few visitors including families, the next generation of museum professionals perhaps! 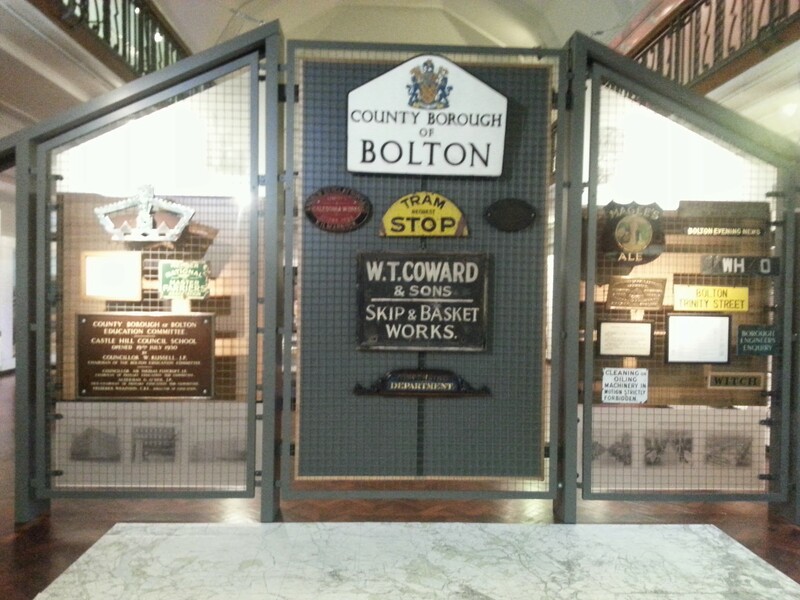 I have been trying to convince my 91 year old Grandfather to visit, being Bolton born and bred I imagine there will be a lot of memories brought back seeing the various exhibits covering everything from Mill workers to Bolton Wanderers football team. I didn’t get chance to look at the Egyptology exhibit as the mobile rang and it was time to collect the car, but Bolton Museum, I will be back next time I’m in the area to sample the rest of the delights you have to offer. The ‘Independent’ Department Store, is it a heritage attraction? As a child growing up in Bolton in the 1980’s there were two department stores in the town, Whitakers and Whiteheads. I don’t recall often going into Whiteheads but we would often go into Whitakers, they had a good sports department for buying swimming cossies and trainers and nice coffee shop. In the days before there was a Costa and a Starbucks on every corner the department store provided essential refreshments on a the Saturday morning shop. The department store was the mainstay of many towns, alongside the market they provided the consumer with pretty much everything you might need from stockings and a fur coat to kitchen appliances and cosmetics. By the late 1980’s the independent department store was becoming a dying breed, being squeezed out of the market by the superstore, and the expansion of high street shops offering the same goods. The independent department stores couldn’t compete with the new competition. Some stores were bought out – Whitakers became part of the Beales group and Whiteheads was bought out by JR Taylor, the latter only surviving a few years before closing in 1995. I imagine that the same thing can be said about department stores in towns all across the country. Yet, if you are visiting London for shopping, you will probably visit a department store, which will be a thriving, busy hub of tourists and shoppers. Why are visitors drawn to these shops which are almost extinct on our local high streets? 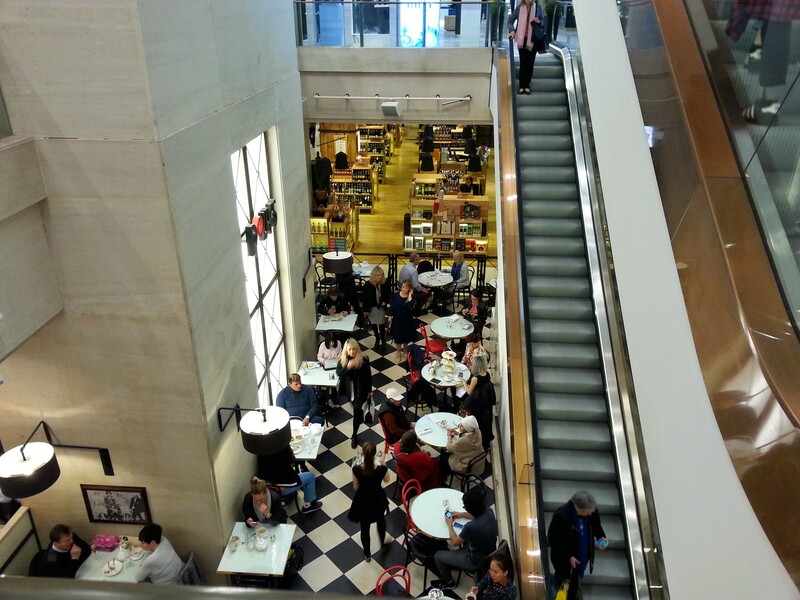 Has the independent department store become a heritage attraction? As Brits, are we drawn to the nostalgia of the High Street past? Are foreign visitors they looking for the ‘typically English’ shopping experience that can only be found in a department store? I looked at the visit London website http://www.visitlondon.com/things-to-do/shopping?ref=nav-ttd and here at the top of the shopping page was the department stores as a must do activity in the capital. So what did I think? 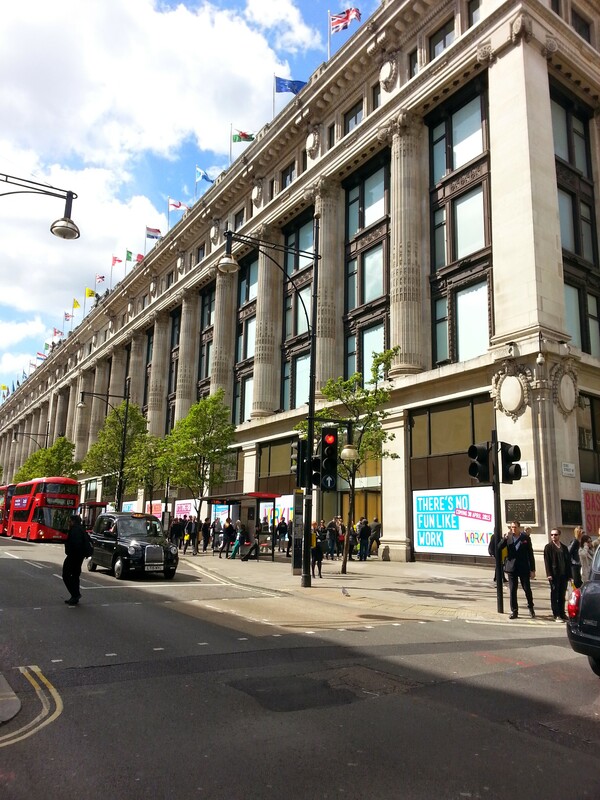 I had a stroll around Selfridges on Oxford street this week, as a bit of research. The clients in my observation were either life long “Well I always buy my scarves from Selfridges” kind of shoppers or they were visitors to London and it was on their list of things to do. I wasn’t particularly moved by my visit to Selfridges, just felt like any other High Street department store but with a prettier outside – can’t deny the architecture is stunning. I’ll be honest, Harrods does nothing much for me, I usually just go in there if I need a loo when walking between the V and A and Tube! And I always get lost and get scowled at by the shop assistants because I am wearing trainers, carrying a rucksack and buy my jeans in Marks and Spencers! In researching this blog the scowls were justified, as apparently Harrods has a dress code! But I can see the heritage appeal, it retains some of its beautiful original features and I was once in there and there was a lady singing Opera on the Egyptian escalators, which was pretty cool! Also it is still seen as a mainstay of the tourist visit to London. I do like Fortnum and Mason, mainly for their leaf teas, beautiful stationery section and I love their Christmas shop! It still feels like a functional shop and not a tourist trap and once again there are some beautiful original features like the staircases and the atrium. I am a huge fan of Liberty of London, mainly for the divine haberdashery department. I love walking around there because I just don’t have anywhere like that were I live, and I admit, I rarely go to buy anything. It feels unchanged, it feels like a shop, not a tourist destination. I visit Liberty for the experience of being there, I get the same feeling when I visit the V & A – so my brain obviously thinks of this department store as a heritage attraction! All these stores have interesting and varied histories and it would seem that shoppers treat them as more than just a shop. They are historically significant and have some beautiful features, continually evolving as consumers want something different. Just like a good museum, they have helpful staff, clean toilets and serve lovely cake! Ultimately I hope that a visit to a department store gets people engaged with the history and the heritage of the store as well as its contents. I had such an enjoyable #museumselfie day in 2014. I was on my sabbatical placement at the Royal Museums Greenwich, working up at the Royal Observatory. There was a degree of friendly rivalry amongst the different twitter accounts on site. It was a day to observe the power of social media, and the more playful side of museums. I had to get involved again this year. 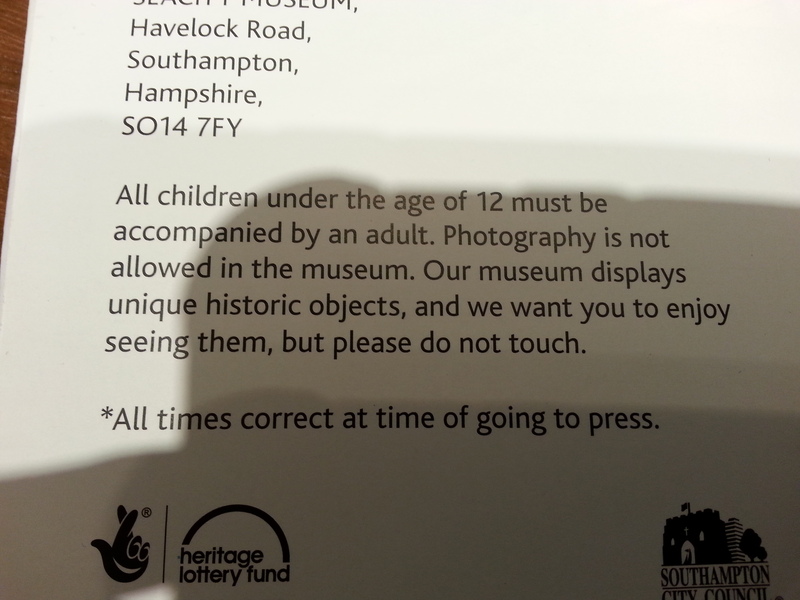 Museums have been (and in some cases still are) places where photography has been banned, limited to certain areas or only to those who are willing to complete a form. You can imagine my horror when I arrived at the Sea City Museum this morning to be greeted with this piece of text on their welcome brochure. Thankfully after having a chat with the friendly welcome volunteer at the top of the stairs, I was reassured that this information was out of date and now photographs were not only allowed, but encouraged, which was great news for me! I had chosen Sea City Museum as it is local to me (a short ferry ride from the Isle of Wight), I had never been before, it is a fairly new establishment and I was keen to see how the HLF money had been spent. I will write another blog on my visit another day and give you the full low down. 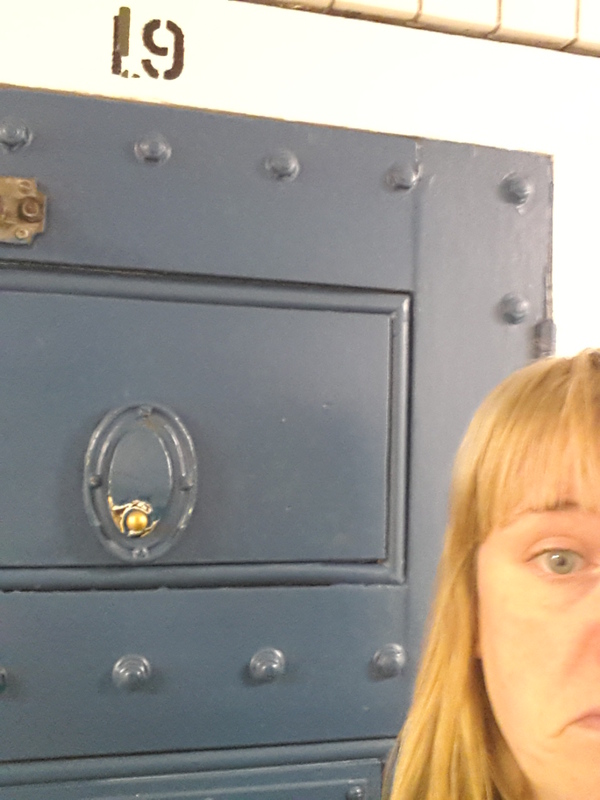 There were plenty of opportunities for #musuemselfies. I was a bit disappointed that there was no interaction from the Sea City Museum twitter account to acknowledge the selfies, they only seem to tweet about once a month, which is a shame. The staff/volunteers I spoke to had no idea what the day was about or that I was trying to promote them through my tweets. I forget that there are still many institutions which don’t ‘get’ the power of social media, I should be thankful my employers have always embraced its use. Well if one is going aboard the Titanic, one should be correctly attired in lifejacket and lovely hat!